One of the most gripping and tragic survival stories in American history is now the subject of a My Name is America book. The Journal of Douglas Allen Deeds starts off full of excitement and optimism. In fact, young Douglas's first words in his journal are, "Today I embark on a great journey." And surely that is how the other members of the Donner Party felt as they left Independence, Missouri on the pioneer trail to their new lives in California. The leaders of the group--Mr. Reed and Mr. Donner--had not made the journey themselves, but they had a lot of faith in their guidebook--The Emigrants Guide to Oregon and California--which explained every step of the way and even offered a new shorter route that would shave weeks off their journey. 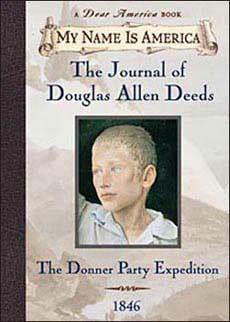 The journal is written by Douglas, a young orphan boy who is warmly welcomed by the families of the party. A courageous and likeable character, Douglas describes the joys and hardships the group encounters en route, and then records--in gripping detail--the series of tragedies that begin to unfold. Before they start the book, give students who are reading The Journal of Douglas Allen Deeds an outline map of the western US and tell them to record key events in the story on the map roughly where they occur en route to California. Inform them that they will need to keep this with their book, and record events as they come across them, as attempting to do so afterward will be very challenging. There is no map in the book, so this will help them to see the enormity of the journey and realize, after many pages have been read, that the Donner Party still had much of their journey ahead of them! Have students label at least 8-10 other key events that happened en route. We figure some teachers will want to have students come up with events while other teachers will want to provide a list of events to label on the map. Therefore, the following list (and the list above) is not included on the handout. - a murder takes place! Students will probably need access to a detailed map of the United States in order to complete this assignment (ie...locating the Great Salt Lake, etc.) You could also encourage them to add in other locations like the Sierra Mountains, the Platte River, etc. For the more artistically inclined students... Provide students with 10 3x5 or 4x7 pieces of cardstock paper (or note cards already cut to that size) and have them draw 'snapshots' of key events along the route. Once done, have them glue the snap shots onto black construction paper and write captions below each snapshop with a white paint pen, like they used to do in photo albums of that era. Staple the black papers together and put a small 'snapshot' drawing on the front or a map of the route, and you have a photo album of the journey. One hint: Suggest to students that they stop every 15 pages, reflect on the events they have just read about, and create a 'snapshot' of one key event. That way the snapshots are spread out and represent the full length of the journey.